Easter in Bulgaria (or any other Orthodox Christian country) is like nothing you’ve seen or experienced before. It is probably the most important religious holiday we have (some may say more than Christmas, and they’d be right) and traditions are traditions. Even though no one really takes Lent seriously (doing it right is giving up a lot of foods that the normal Bulgarian can’t cope without… mainly meat) there’s very specific rules around Easter. This year, by the Orthodox Church, Easter was on the 12th of April (last year it was on the 20th), Sunday. Before sunday there’s a few vital things that every self-respecting christian needs to do. 1. Sweetbread – either from the local bakery or homemade, it is a very important part of Easter morning and there’s always queues that go on for miles in front of the bakeries that whole week. People go crazy over that bread. 3. The red egg of health and prosperity – it’s a very important tradition. The first red egg that is ready is taken by the oldest person and they put little dots on the youngest people’s faces – one on the forehead, one on the chin, one on the left cheek, one on the right, in the shape of a cross. That is to ensure the health and prosperity of the youth throughout the year. 4. Last year’s egg – somewhere on a high shelf in the house (for some reason with us it’s always in the kitchen) rests the first red egg from last year. Exactly right, from last year. As it has been hard boiled and dyed it doesn’t stink and it still looks nice and red (or at least it should, if it doesn’t you’ve done something wrong). 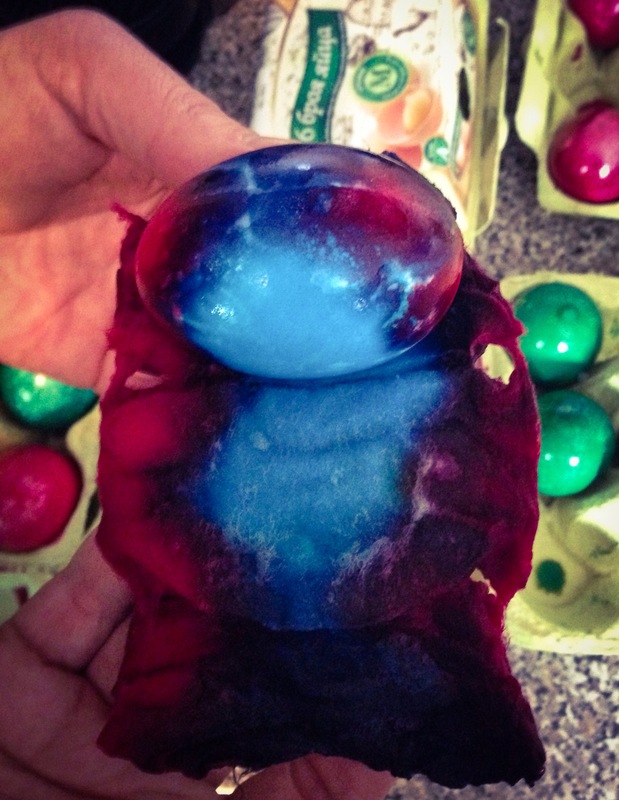 The egg is then broken, to see what the inside of it looks like. The better it is, the better the house’s well being. Then it’s place is taken by the new egg, which will endure for the next year. 5. Good Friday – The Orthodox Bulgarians call it ‘Razpeti Petuk’ (Разпети петък) which comes from the word ‘razpyatie’ (разпятие) – crucible, so it’s not really Good Friday but more like Crucified Friday. As the story goes, Christ is taken down from the crucible and on the third day (Sunday) he would resurrect. On this day, Friday, people go into churches for a special service where they are blessed, they eat something given by the priest and then they go underneath a table and cross on the other side. I’ll be honest, I don’t completely understand that tradition but it is really funny to watch the people struggle (and I know how bad that sounds, but everyone’s having fun with it anyway). 6. Saturday night, midnight – The beginning of easter. Churches are filled with countless people and exactly at midnight the great service starts where everyone starts circling the church or chapel or whatever temple they’ve gathered in singing a specific traditional song, holding candles and some eggs to start the big egg battle royale. 7. The Greeting – From archaic Bulgarian, the phrase would literally be translated as ‘Christ resurrected!‘ To which whomever you said it to (which is everyone) answers ‘Indeed [he] resurrected!‘ For about a week from Easter, anyone you see you need to greet in this way according to custom. This year it wasn’t as bad as previous years, where everyone got about a thousand calls and texts and messages all saying that exact phrase. 9. The Lamb Roast…. – it speaks for itself. Everyone that day no matter where or how, eats lamb for lunch and/or dinner. Traditionally it’s garnished with potatoes and there’s the green salad (salad, lettuce, radishes, sliced hard boiled eggs, cucumber and spring onions… or whatever but that’s the general idea). It is utterly incredible. And that is how you get yourself a nice, proper, Orthodox, Bulgarian Easter. Something I believe any foreigner has to experience at least once, and I’ve got a few to to back me up on that. 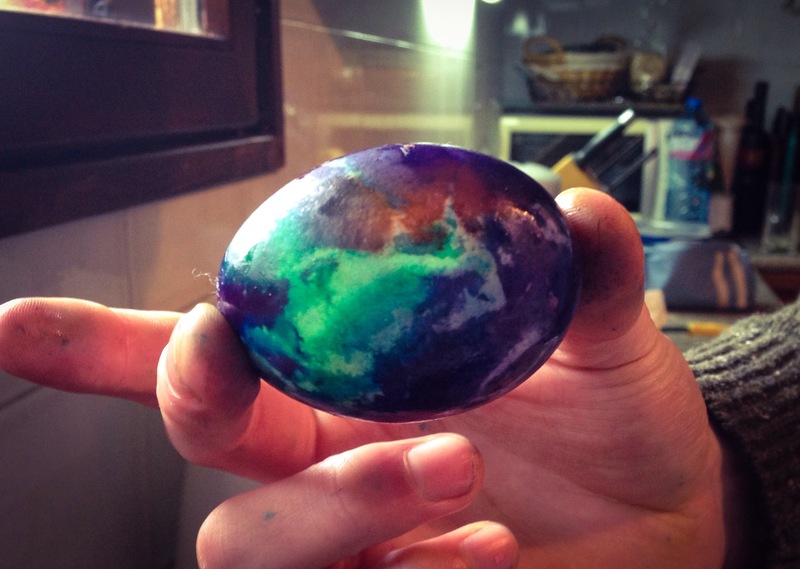 ;) Now, as we are artists, let’s see the most interesting and creative and artistic bit of the entire story.. the egg painting. My nan has always had us over to dye eggs at hers (she lives in a nice remote house up the mountain) so it’s always a very pleasant experience being in their home. 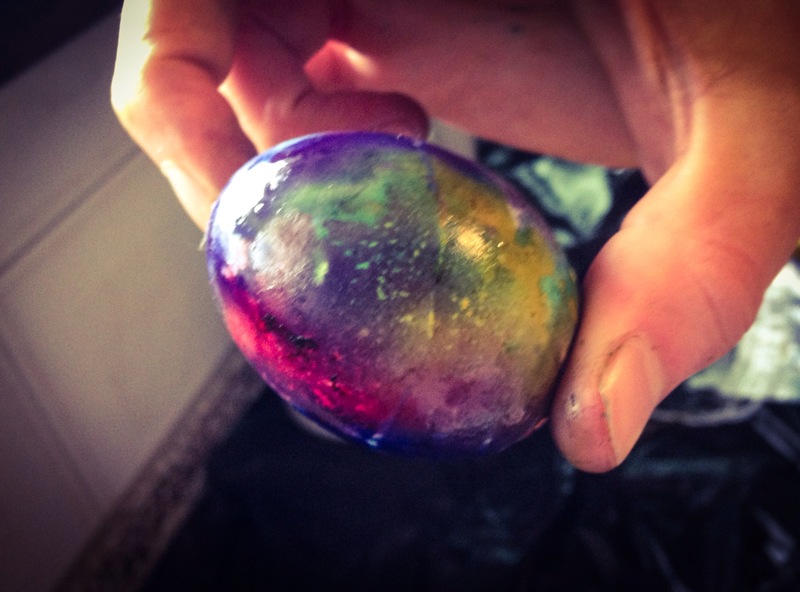 Usually they let me paint over the eggs, being artistic, but I never had enough time to do as many eggs as I wished. This time I had so much help I was worried we were going to run out of plain non-painted eggs. We had to use gouache (or tempera paint as they call it around here) and markers which I supplied. It was such an incredible experience having two of my closest friends there during this pure family experience… It made it seem more of a family! And getting to teach someone about how all this works really did help me see it all with new eyes. the final arrangement always resembles a nest. and it always looks lovely and colourful. this particular one is from my nan’s house.